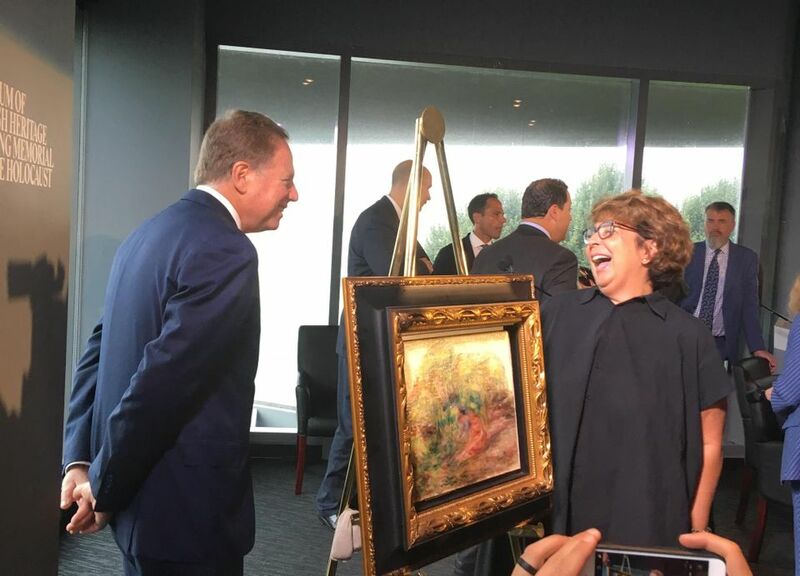 Ending a long odyssey, a Nazi-looted painting by Pierre-Auguste Renoir was officially returned today (12 September) in New York to the sole surviving heir of the Jewish art collector from whom it was stolen. At a restitution ceremony at the Museum of Jewish Heritage in Manhattan, Two Women in a Garden (1919) was presented to Sylvie Sulitzer, a delicatessen owner from a small town near Marseilles and the granddaughter of the Parisian art collector Alfred Weinberger. Before the painting was unveiled, Sulitzer read a statement highlighting the importance of restitution as a form of justice. Also in attendance was Robert Morgenthau, the former Manhattan district attorney who blocked the return of two Egon Schiele paintings to Austria from the Museum of Modern Art in 1998—an act that led to greater international cooperation in processing claims of art stolen from Jewish families during the Second World War. Morgenthau spoke of the importance of collaboration in rectifying such cases. The painting, created in the last year of Renoir’s life, is a whirlwind of broad brushstrokes depicting the blurred figures of two women sitting in the grass near what appears to be a large tree. Weinberger purchased the work in 1925 for his extensive art collection. As the Nazis advanced on Paris, Weinberger was forced to flee with his family and left his collection in a bank vault in Paris for safekeeping. In 1941, while the family hid in the small Alpine town of Aix-les-Bains (Weinberger was a maquisard, a guerrilla fighter for the French Resistance), a Nazi task force devoted to appropriating property raided the family’s bank vault, taking Two Women in a Garden and numerous other works. After the war ended, Weinberger set out to restore his collection, registering claims with both the French and German authorities. While he was able to locate some of the works, the piece by Renoir remained missing. “Nobody told me about the painting,” Sulitzer said in an interview. “We never talked about the war at home. It was taboo.” When Sulitzer’s parents divorced, she and her mother moved in with her grandparents, and even though she knew her family had a deep appreciation for art, her grandfather never mentioned any of the missing paintings. Nevertheless, when Jacques Chirac, then France’s president, created the Commission for the Compensation of Victims of Spoliation in 1999, Sulitzer submitted a request in her grandfather’s name in case anything turned up. Several years ago, Sulitzer received a call from a German law firm inquiring whether it could help her track down some of her family’s stolen artwork. She agreed. The firm discovered in 2013 that Two Women in a Garden was listed for sale at Christie’s in New York and contacted the auction house, which took it off the block and asked the FBI for assistance. Monica Dugot, the director of restitution at Christie’s, said the auction house had done extensive research on the painting before offering it for sale but that the work was not registered with a German government database of art looted by the Nazis until after the auction had already been announced. Sulitzer says the US government invited her to the restitution ceremony at the museum and that when she said she couldn’t afford the plane ticket, it offered to pay for her journey. It is her first trip to New York. (She was very excited about trying the food at Katz's Delicatessen in Manhattan.) And if she's lucky, Sulitzer might be back someday. From her grandfather’s collection, four more Renoirs and a Delacroix remain unaccounted for. She said she was thrilled to see her grandfather’s Renoir for the first time, but “for me, it’s not the fact of the painting really. It’s a kind of justice.” She said she wanted to show her deceased “beloved family, wherever they are” that justice can prevail. Yet she does not plan to hold on to Two Women in a Garden: it is headed for sale at Christie’s at a daytime auction on 12 November. “I can’t afford to keep it,” Sulitzer says. (She says she now owes money to the French and German governments in connection with compensation she previously received.) “I would have loved to keep it,” she adds. The work is scheduled to remain on view at the Museum of Jewish Heritage, which has previously presided over such handovers of looted art, through Sunday (16 September). But Dugot says the auction house is hoping that the viewing can be extended for a couple more weeks.